Real Cheese People® never settle for less. 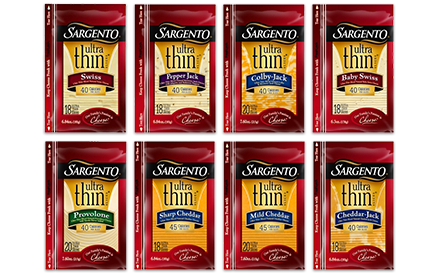 That’s why Sargento Ultra Thin® Cheese Slices pack 100% real, natural cheese in every thin slice. So they’re perfect to roll into a wrap. Fold on to a sandwich. Or wind around a kebab. So much taste, without an ounce of compromise. Real Cheese People® have 45 reasons to love 45 calories. There’s so much to love in these 100% real cheese, real thin slices – let us count the ways. You get all of the flavor. None of the compromise. There’s no shortage of ways to layer, wrap, mix and match ’em. IT ONLY TAKES 45 CALORIES TO BRING YOUR SANDWICH 100% FLAVOR. Their über flavor makes them ultra good. You can roll, fold, sneak and stack ’em. IT’S LIKE ADDING A SLIVER OF HAPPINESS TO ANY SANDWICH. Your panini press doesn’t have to work as hard. They come in 8 melt-in-your-mouth varieties. They look delicate and dainty, but they taste anything but. Sometimes a sandwich requires a deft hand and subtle touch. They give shaved, maple-glazed ham a worthy counterpart. Taste buds love to savor their ultra thin flavor. They can make a whole-wheat quesadilla burst with pride. They make a light lunch a little more luscious. THEY CAN SAVE YOUR SANDWICH WITH A SOFT KISS OF BABY SWISS. Why smother your turkey burger when you can make it swoon. A slice that’s oh-so-thin makes your tuna melt oh-so-fine. You get 45 calories, but full-on flavor. Occasionally veggie wraps warrant a wisp of Provolone. They taste like they were cut from the block. Because they were. Crowned a top innovative product in 2014. ANY SANDWICH FROM A CHEESE-FREE EXISTENCE. At 45 calories,* you can add more of them. They’re nutritious in the most ultra-delicious way. Light and lithe, they’re impressively limber. Burritos love being wrapped in a delicate blanket of Pepper Jack. Ultra Thin® Cheese tastes great au natural. They play well with condiments. ONE 45-CALORIE SLICE CAN MAKE YOU LOOK FORWARD TO LUNCH. They let a grilled cheese watch its girlish figure. There are oodles of ways to eat ’em, use ’em and love ’em. You never feel eater’s remorse. You sacrifice nothing. Not a thing. Zip. Zero. They never give your food an inferiority complex.